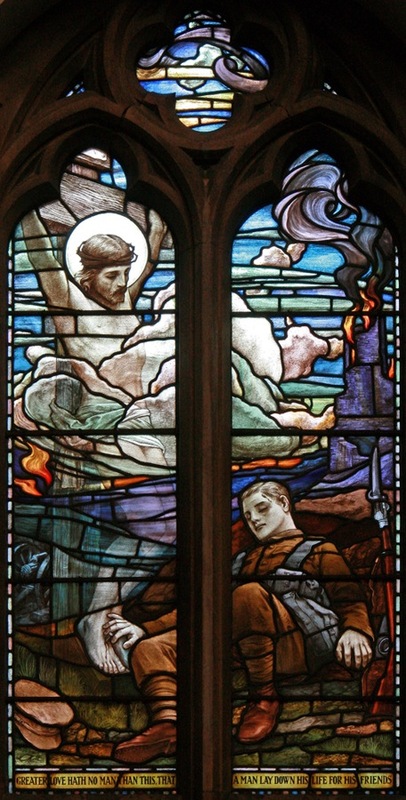 James Clark's The Great Sacrifice, later also known as Duty, is seen here first as a stained glass window in William Butterfield's St Mary Magdalene, Enfield. 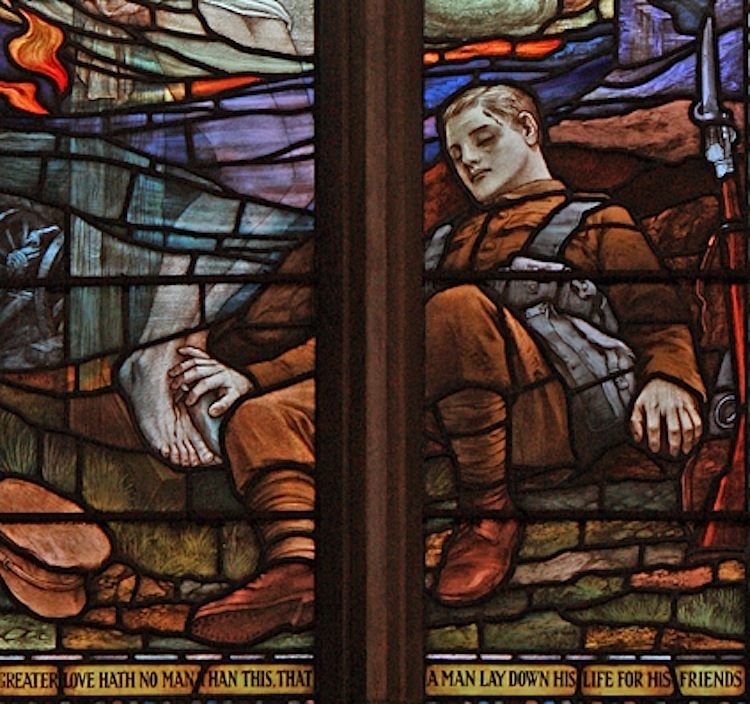 It is a war memorial window in the north aisle, installed in 1919 in tribute to those men of the parish who had lost their lives in the Great War. 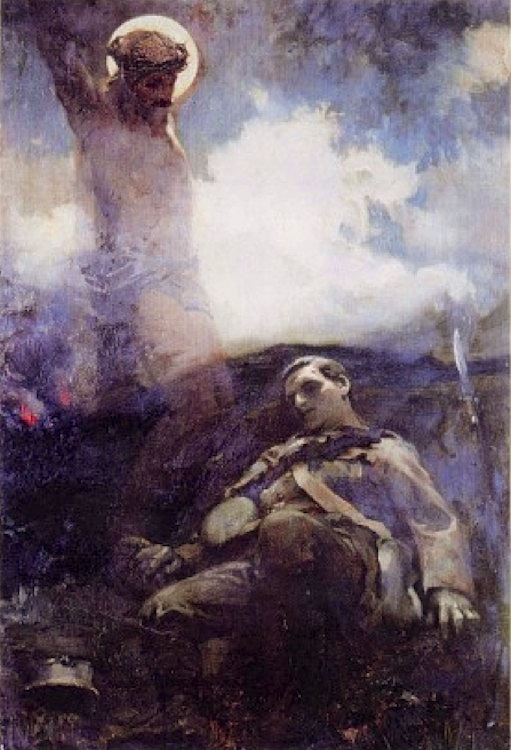 The dead soldier on the right, retaining his youthful good looks, is shown lying by the cross, his hand on Jesus's feet, as if he was inspired by, and is replicating, the sacrifice of Jesus. Although smoke swirls in the background and flames still flicker on the smouldering battlefield, he seems to have died peacefully, consoled by this vision, in the sure knowledge that he was doing what had to be done — as Clark put it later in his second title, his "duty." The original work on which the design was based was a painting — one that had been well known for several years before the window was installed here. It had first been shown to the general public as a special fold-out in The Graphic's Christmas number of 1914, where it was described as "the finest picture that the war has yet produced" (qtd. in Fox 123). Before long prints of it had been on sale, and these copies could often be found in other churches, and in hospitals and other public places all over the country — and beyond it. Clark gave the popular original to the War Relief Exhibition in aid of the Red Cross at the Royal Academy in 1915, and it was bought by no less a personage than the King himself. After that, the Queen gave it to Princess Beatrice, youngest child of Queen Victoria, who then gave it to St Mildred's Church, Whippingham, on the Isle of Wight, in memory of her son Prince Maurice of Battenberg, who had been killed at Ypres. It hangs there still, in the Battenberg Chapel. James Clark himself (listed in Eberhard as the "firm" responsible) was known for his stained glass work, and the painting has been beautifully transformed into this medium. Writing about the British art of World War I, a recent critic has seen the work in a less admiring light than others, as "a flagrant idealization of death" (Fox 123). But it is easy to understand why it was so popular at the time. Photographs by John Salmon, and image of the painting kindly supplied by Charlotte Taylor of Hartlepool Art Gallery. Text by Jacqueline Banerjee. You may use these images without prior permission for any scholarly or educational purpose as long as you (1) credit the photographer and (2) link your document to this URL in a web document or cite it in a print one. The Battenberg Chapel. St Mildred's Church. Web. 14 July 2015. Eberhard, Robert. "Stained Glass Windows at St Mary Magdalene." Church Stained Glass Windows. Web. 14 July 2015. Fox, James. British Art and the First World War, 1914-1924. Cambridge: Cambridge University Press, 2015. "The Nave Stained-Glass." St Mary Magdalene. Web. 14 July 2015.